Given his parents met while working at Bovis Homes more than 30 years ago, Charlie Bond has always had a close connection to the Gloucestershire housebuilder. And it is a connection getting stronger by the day as he is now a rising star at the Bishop’s Cleeve-based business. Charlie, area sales manager at the company’s Western region, followed his dad Peter into the sales side of the business. His mum Jane was working in administration when the pair met back in the 1980s. And Charlie, 27, has been such a hit with his colleagues – who include friends of his parents – that he recently won an Outstanding Achievement prize at Bovis Homes’ Annual Awards. Charlie, from Cheltenham, who covers Gloucestershire and parts of Oxfordshire, said: “It was amazing to be recognised for my work at Bovis Homes and to win an award was truly brilliant. I didn’t expect it at all, it’s a great feeling. “It feels even better that my mum and dad both worked for Bovis Homes. I’ve really worked hard here, and it feels very natural and comfortable. It’s great that some of my mum’s best friends still work here. Charlie joined Bovis Homes in 2015 as a site staff sales co-ordinator, whose role was to facilitate communication between the sales and build teams. He has been promoted twice in two years and was offered his current role after covering for a colleague who went on maternity leave. Charlie said house hunters were attracted by the features and financial incentives of new-build homes, plus the relationships they can develop with build and sales teams at the locations. “With a new-build home, absolutely everything is modern and that is a huge draw,” he said. “It’s all a blank canvas and, financially, new-builds cost home owners less to run as they’re more efficient. Charlie read Marketing, Advertising and Public Relations at the University of Worcester before joining a printing company and later moving to London to work in estate agency. 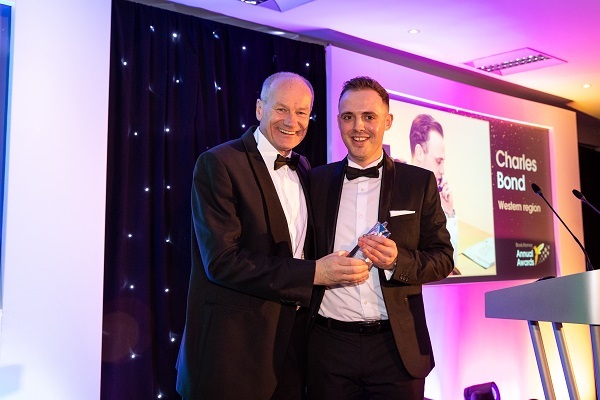 Charlie said his Outstanding Achievement recognition at Bovis Homes’ 2019 Annual Awards was his proudest moment to date. The awards, which were held at the De Vere Hotel in Cirencester, also celebrated apprentices, suppliers and contractors and there were gongs for top customer service and health and safety. Supriya Ray, Western regional managing director at Bovis Homes, said: “Charlie fully deserved this award for all his hard work and commitment.